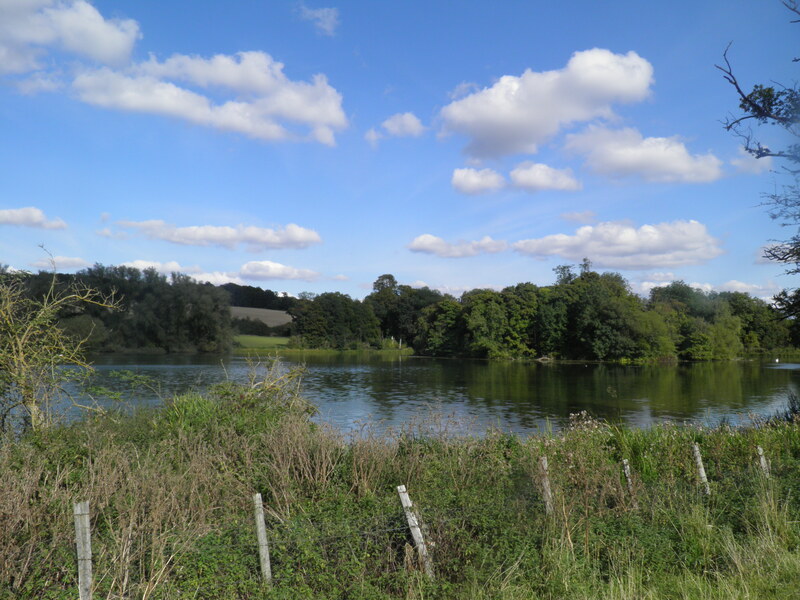 This route has all the hallmarks of the Chilterns – beech woods, huge views, clear-running streams, soaring red kites, picture book villages and fine pubs. 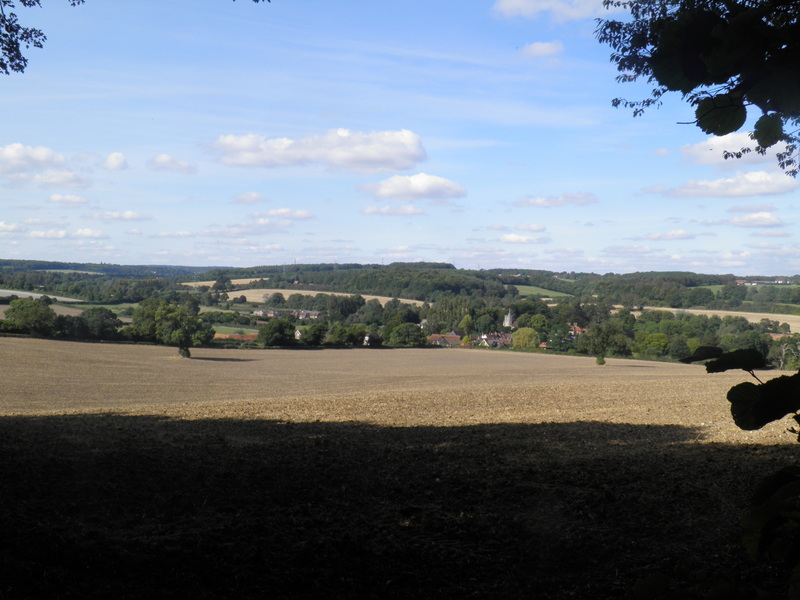 A super walk for a bright autumn day as the trees begin to turn, all just a few minutes from London’s outer boundary. Underfoot: A mixture of field paths, woodland and minor roads. Most are well drained, but some fields will be muddy after rain. Good footwear advised. 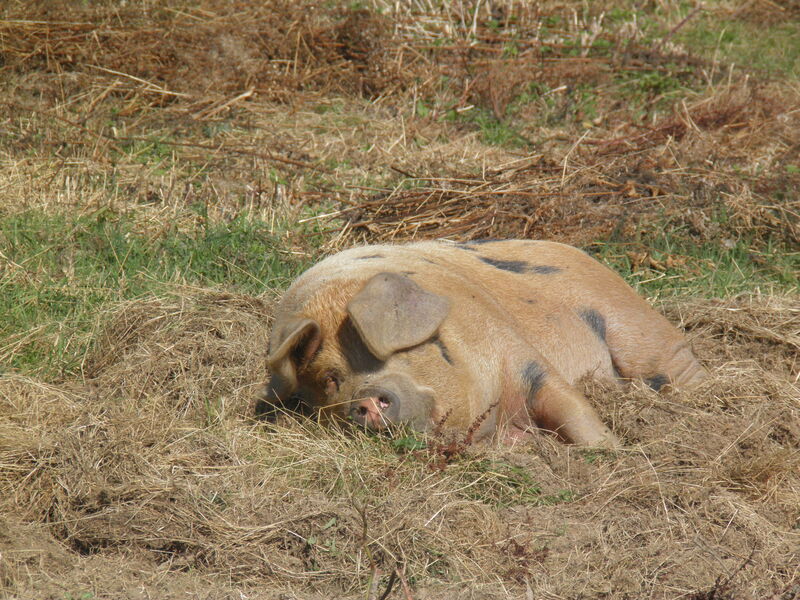 Terrain: Frequent ascents and descents, but almost all are very gentle. One relatively steep final ascent to Amersham station. Maps: 1:50,000 Landranger 175 Reading & Windsor and Landranger 165 Aylesbury & Leighton Buzzard; 1:25,000 Explorer 172 Chiltern Hills East. 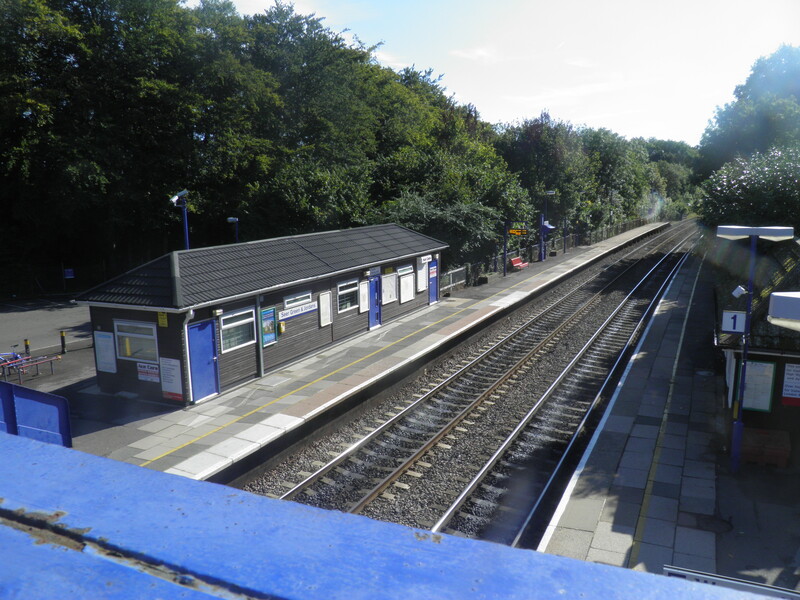 Getting there: Seer Green & Jordans is a minor station on the main line from London Marylebone to Birmingham. Chiltern run a train every hour from Marylebone (31 mins) via West Ruislip (14 mins) for Central Line. 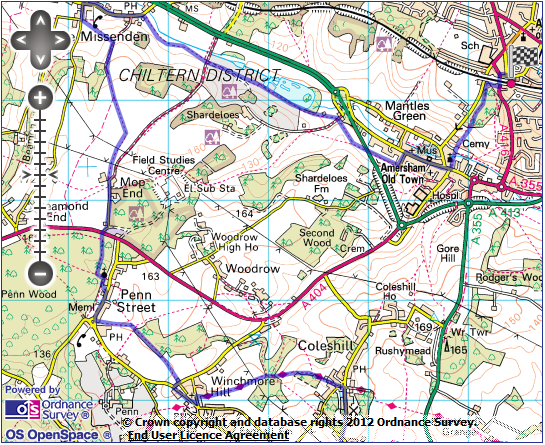 Useful websites: Parts of this route follow the waymarked Chiltern Way and South Bucks Way. 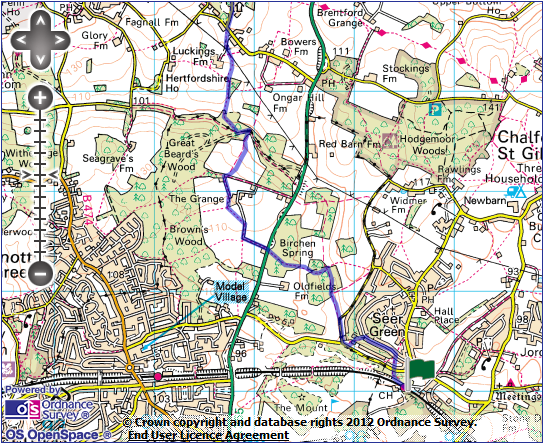 The route passes through the Woodland Trust land at Penn Wood and the fine Amersham Old Town. Getting home: Amersham is at the northern end of the London Underground Metropolitan line, with 2 trains per hour to Aldgate (73 mins) via Harrow-on-Hill (32 mins), Baker Street (56 mins) and Kings Cross St Pancras (62 mins). These are supplemented by 2 Chiltern Railways services per hour to London Marylebone (37 mins) via Harrow-on-Hill (23 mins). Fares: The cheapest combination of tickets is to purchase a Off-Peak Zones 1-9 Travelcard (you might think there are only 6 zones, but the outer reaches of the Metropolitan Line have a further 3!) for £11.60 (£4.90 11-15 year-olds, £7.60 railcard). 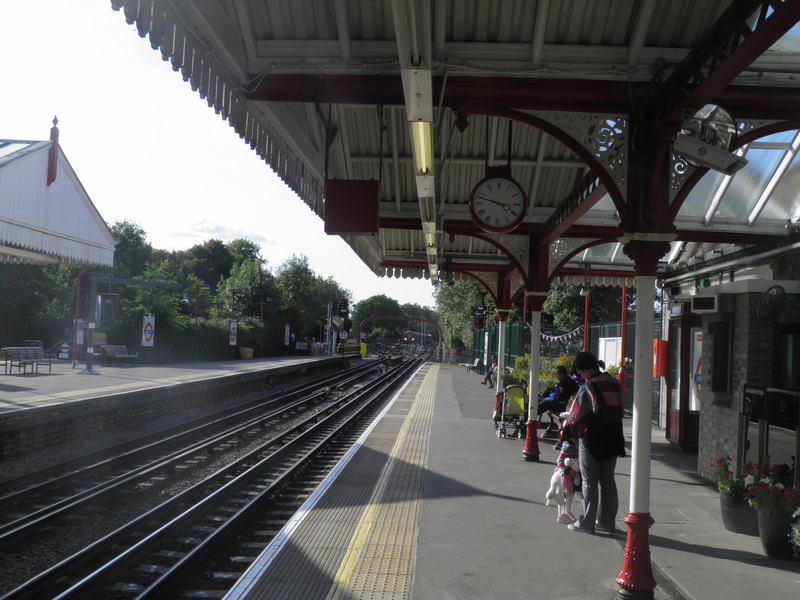 For the outward journey, you will also need a Zone 6 boundary – Seer Green single for £4.60 (child £2.30, railcard £3.05). The Travelcard will cover the entire journey back to London. 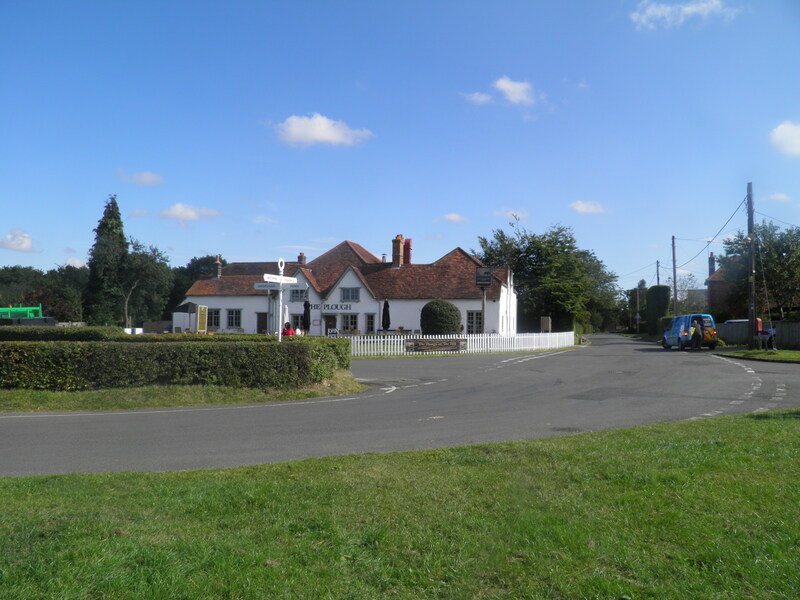 The little station of Seer Green & Jordans didn’t open until 1915, ten years after the line it stands on, and was originally named Beaconsfield Golf Links, after the large course to the south of the line. 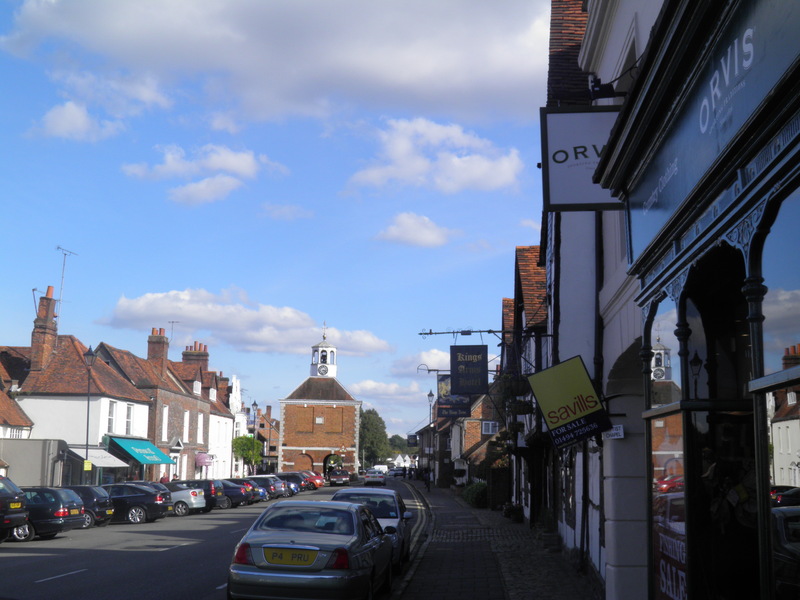 It subsequently took the name of the two villages it serves – Seer Green, formerly an agricultural village of cherry orchards, now a wealthy commuter base; and Jordans to the east, once a noted centre of Weslyanism. Arriving at Seer Green & Jordans from London, cross the footbridge and cut straight across the station car park to a small gateway opposite. Take the tarmac path, dropping gently through the woods, before descending more sharply to busy Longbottom Lane. Cross and take path opposite, climbing between ostentatious suburban villas to a minor road. Turn left, passing more attractive stockbroker belt homes. Where the road swings right, after a house called Wild Woods, take the signed footpath to the left. The path drops between high fences back to Longbottom Lane. Turn right, then immediately right again on Bottom Lane. 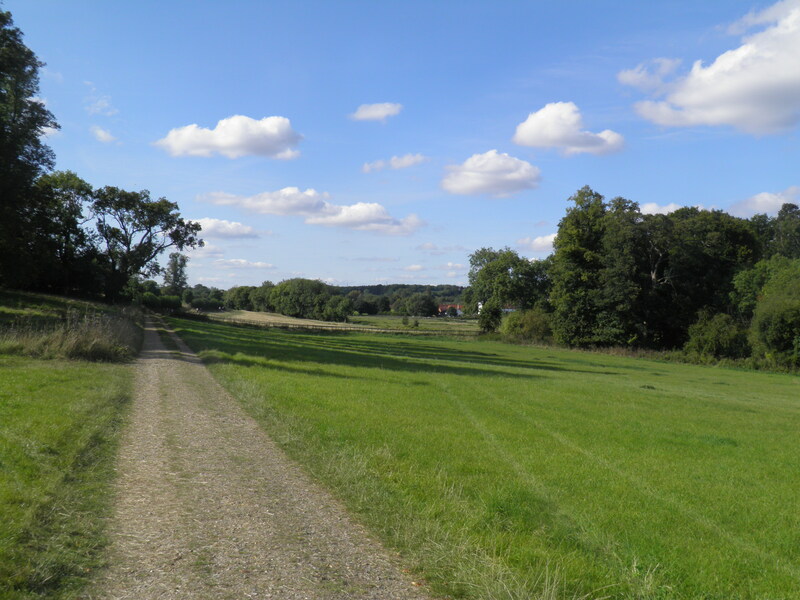 After 200m, where the road swings right, take track straight ahead along a small valley (bridleway sign). At a junction of bridleways, head left on a clear path cutting straight through Blue Close Wood. Nearing the edge of the wood, you reach a sign making a crossing of paths. Follow the footpath sign to the left, climbing gently. The path leaves the woods at a footgate and cuts across a small field to enter another set of woods at Birchen Spring. The path twists through woods between barbed wire fences to emerge at the A355. opposite. 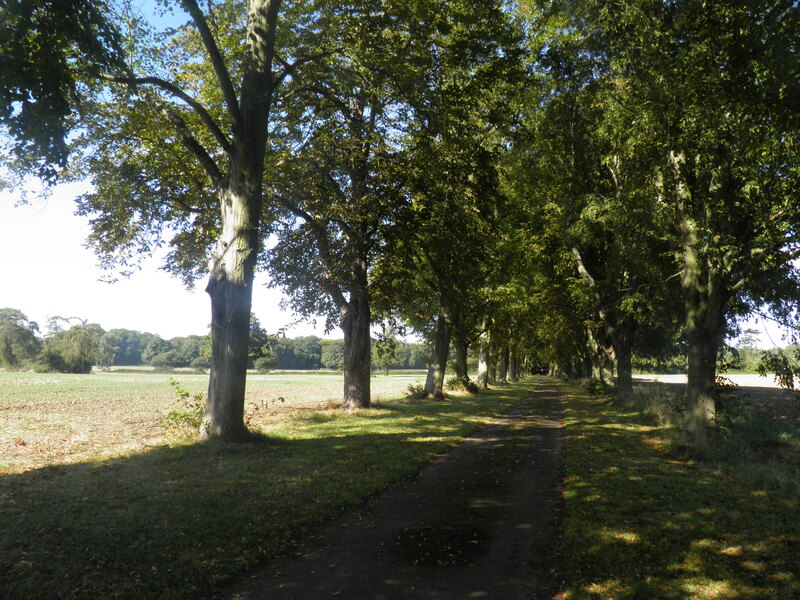 Through a second gate, you join the tree lined driveway leading from South Lodge to The Grange. Keep to the drive as it swings sharply right and begins to gently climb. The 250 acre estate of The Grange lost its historic house, replaced by a much more modern home. This was formerly owned by Chelsea boss Ken Bates, and is now the home of Lord Paul, industrialist and major donor to the Labour Party and London Zoo. After about 150m, follow the footpath sign pointing you left off the drive and onto a clear path across the fields. On reaching the corner of the band of conifers hiding The Grange, ignore the footpath to the left and keep straight ahead beside the conifers. Join a small track and keep straight ahead to reach hilltop Wood Cottage. Beyond the cottage, follow a drive swinging right, then immediately head left on a narrow path (bridleway sign) beside a gate. The official path can be very overgrown, so it is best to hop over the fence to the right and descend along the wide field verge. As you near the valley bottom, find a suitable spot to rejoin the official path. At a cross-tracks in the wooded valley floor, head left. After about 300m, keep your eyes peeled for a waymark post showing a footpath to the right. Follow this through the trees. The path can occasionally be a little unclear as it twists uphill, but there are a few waymark posts at key points. Leaving the wood, you swing right up a track and then straight ahead along a field edge, climbing gently beside a wood. At the top of the wood, pass through a kissing gate ahead. Climb one more field edge then at the corner of the field, underneath a pylon line, cut left over a stile and follow the pylon line diagonally across small field beyond. A stile leads out onto Luckings Farm drive, where you turn right. On reaching a road, head left, swinging right at junction on Windmill Hill (signed to ‘Village centre’). 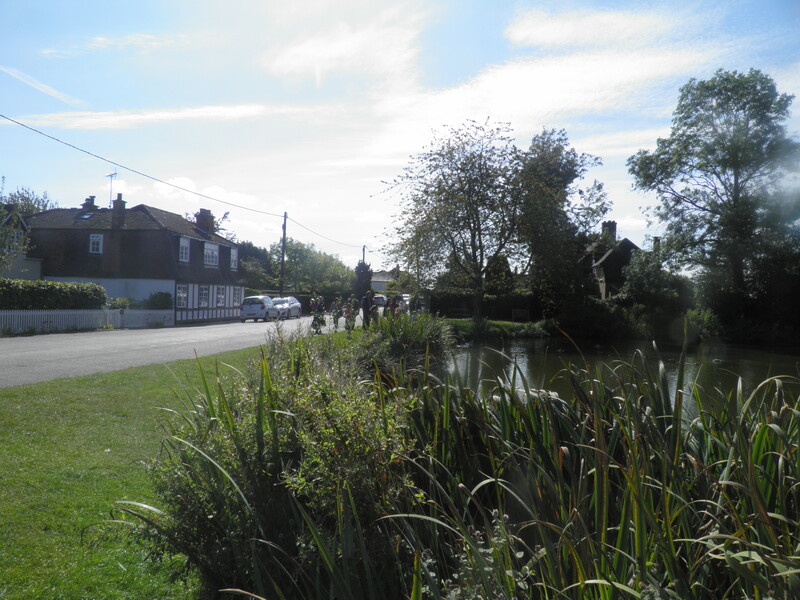 Pass through the houses of Coleshill Common, passing its lovely willow-draped pond. Just beyond, opposite the Red Lion, take path left beside chapel’s graveyard to reach another road. The little village of Coleshill, with a fine selection of cottages and villas, including early 19th century cottages with bottles incorporated into the upper walls for decoration, was known as Stoke until the 1840s, when it was transferred from Hertfordshire into Buckinghamshire. Farm on the left. A pair of gates leads you out into fields again. Presented with a choice of 2 footgates ahead, take the left hand (Chiltern Way), keeping to the hilltop path. Beyond the next footgate, the path swings left then drops clearly across field to the edge of West Wood. Keep straight ahead through this narrow strip of woodland, then follow Chiltern Way waymark to follow the right hand side of the hedge ahead. 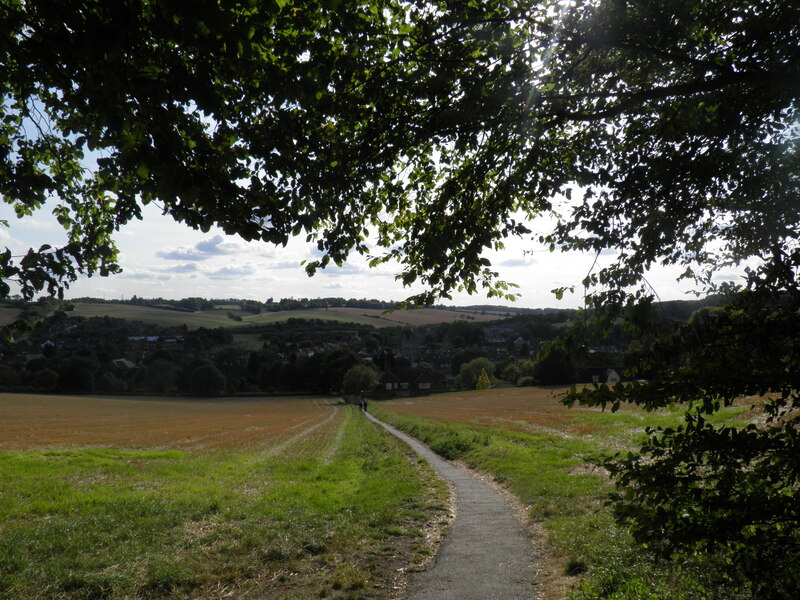 Continue on this clear hilltop path for a little under 1km before it drops down between hedges to emerge opposite Winchmore Hill’s Methodist Chapel. 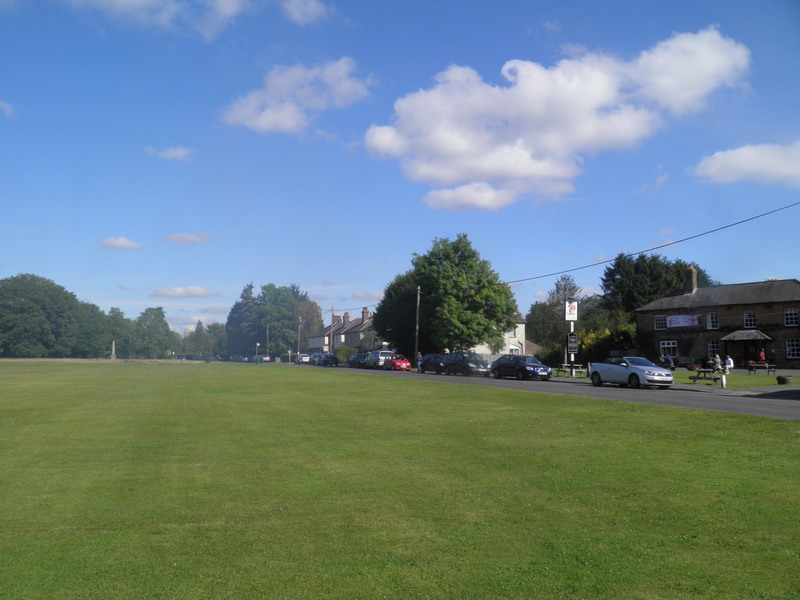 Turn left on road to cross roads by The Plough on Winchmore Hill’s village green. Ramsay MacDonald, the first Labour Prime Minister; and was subsequently owned by the husband of Carry On star Barbara Windsor – she would occasionally serve at the bar. Turn right on the road beside green (signed to ‘Wycombe’). At road junction at the bottom of the green, turn right (signed to ‘Amersham’). Opposite the bus shelter, take a signed footpath left (marked as the Chiltern Heritage Trail). The clear path leads across two fields before running just inside edge of Tragoe’s Plantation. Leaving the wood at a kissing gate, cross the track and take a path SA. After about 20m, in a small dip, a faint path cuts across. Take this left, leading to a footgate. Beyond, the path runs the length of a field beside a small industrial unit before emerging in Penn Street beside its lovely village green, lined by cottages on one side and woods on the other. family became linked with the Howe dynasty by marriage at the end of the 18th century, and Penn house, just to the south of Penn Street is the family seat of the Earls Howe. It is the residence of the current Earl Howe, Frederick Richard Penn Curzon, now a junior defence minister. Turn right on the road towards Holmer Green. Pass the lovely Squirrel pub, the war memorial and a little pond. 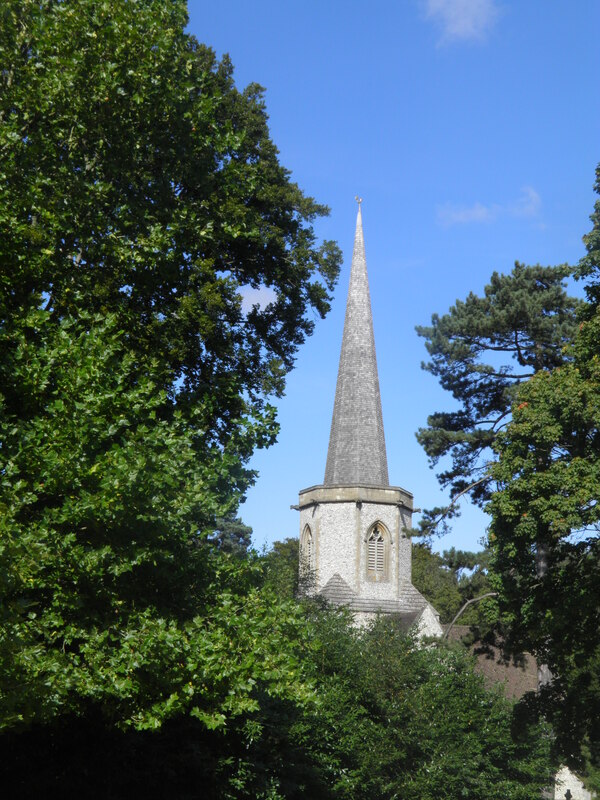 leads you across a car park to Penn’s lovely secluded parish church, with an octagonal spire. In front of the church, turn left on the firm path, passing a sign marking the entrance to the Woodland Trust’s land at Penn Wood. Just beyond the end of the graveyard, take a path right (with a footpath waymark). Keep straight ahead along this path, first bouncing on pine needles, then into deciduous woods, to emerge on the busy A404. Cross with care and take the minor road almost opposite towards Mop End. Very soon you head left, on a smaller road, still towards Mop End. Ignore the first set of paths to left and right as you pass the first houses of Mop End. Nearing the end of the road, a bridleway sign points along track to the right. Do not take this, but immediately beyond it, take a well-hidden footpath over a stile (with a waymark) and into a thistley field. track. Follow this to the right, over the high fields. Around 200m after passing a pylon, look out for a faint path cutting left and take it – this is much easier to find when the crops are high. 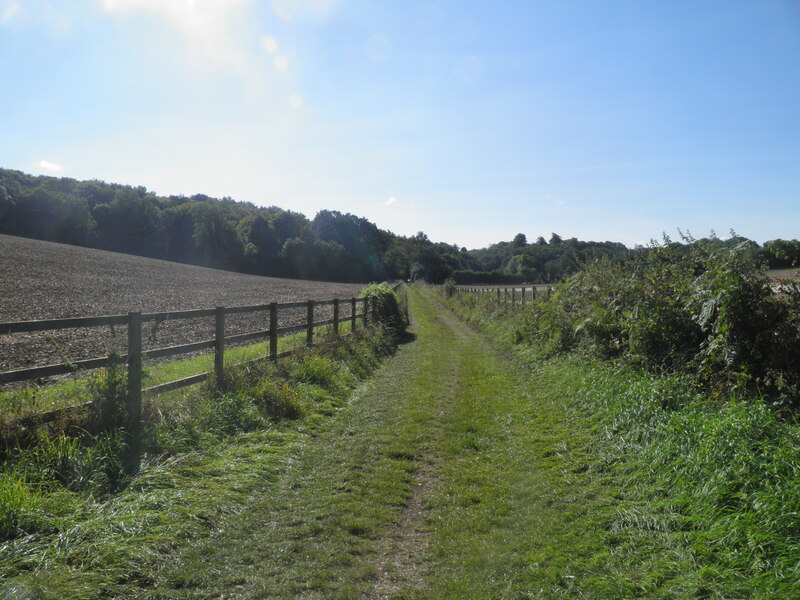 The path cuts diagonally across the large field and then across the corner of a second to reach a stile giving access to the narrow bridleway of Toby’s Lane. The Lane descends steadily, first between high hedges, then past Breaches Wood and then between rows of trees. through it, taking the path cutting across the field to the houses of Little Missenden nestling below. 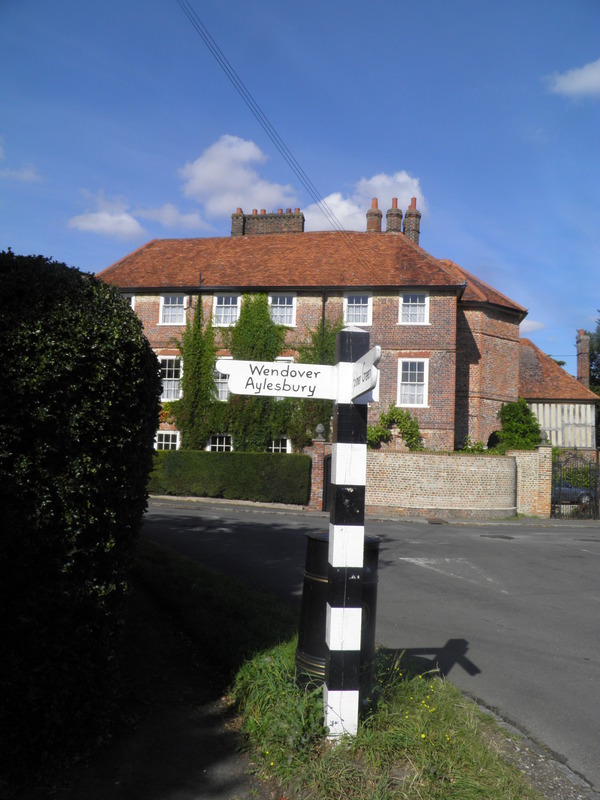 pretty village is now frequently used as a film location, including inevitably for Midsomer Murders, and is well known for music and comedy festivals. Reaching a road, head right, passing half-timbered cottages to reach the centre of Little Missenden. In front of the large rectory, take the road to the right. Pass the Red Lion and more delightful cottages. 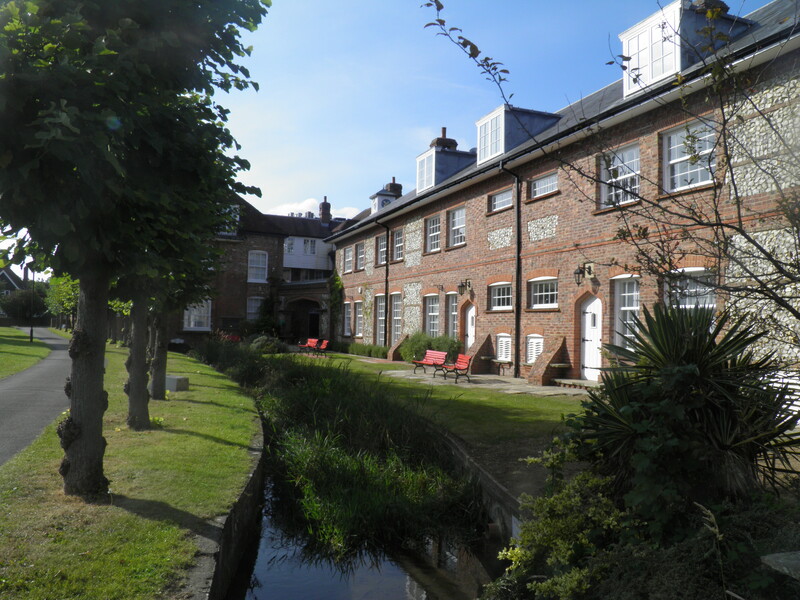 You pass grand Missenden House and another pub, The Crown. A little after The Crown, where the road swings left, keep straight ahead on a track towards Kennel Farm (marked as South Bucks Way). 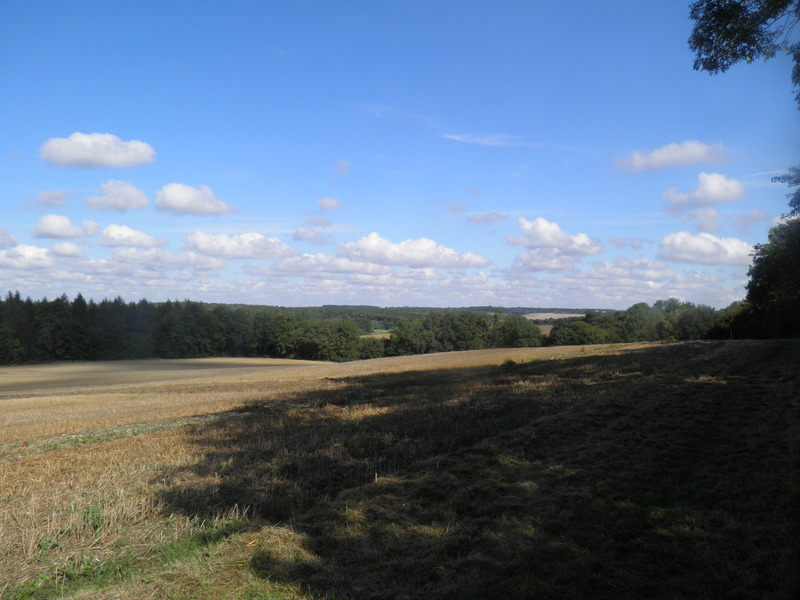 The track winds along the lovely valley of the Misbourne. smaller track keeping to the right of the river. On reaching crossing Mop End Lane, continue straight ahead through kissing gates and continue on a clear track into Lower Park. Beyond a footgate, the path drops to the reedy shores of a large lake. 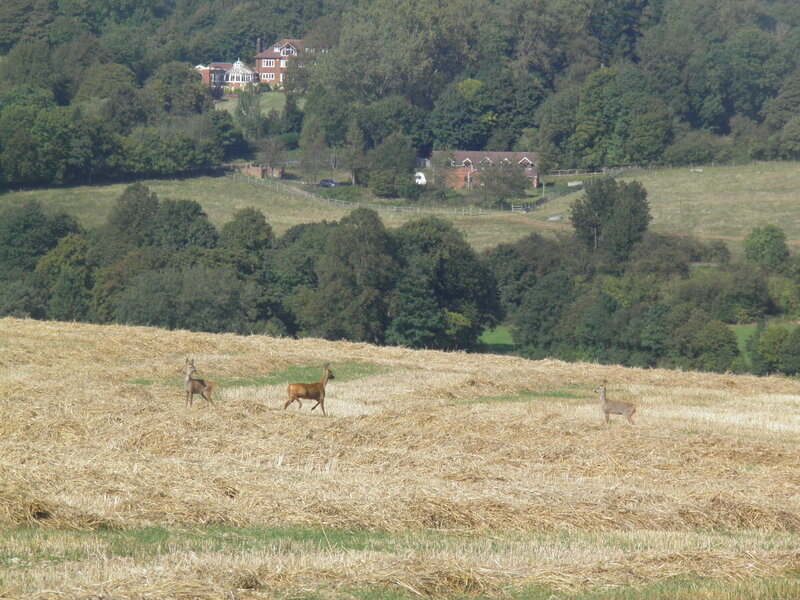 by a local amenity society, which also led to the protection of the parklands you are walking through from development. The grounds were laid out by landscape architect Humphrey Repton in 1793, using elements of previous landscaped grounds on this site, and are grade II* listed. Beyond the lake, you emerge on a cricket ground. Drop to the pavilion and follow its tarmac drive. On reaching another drive, by whitewashed lodge houses, cross and pass through the kissing gate opposite. From the gate, a path leads gently uphill through the field. Cross a gravel drive and then follow the right hand edge of the woodland ahead. Just beyond the end of the wood, pass left through a hedge on stile to reach the busy and fast A413. Cross with care – there is good visibility – and take the footpath slightly to the right. Keep straight ahead on this path, past the ends of some very long gardens, to reach Cherry Lane. hodge podge of cottages, farms and inns. Head right, to reach the colonnaded market hall, sticking out into the street. 16th century onwards, including a number of fine coaching inns. The fine market hall itself dates from 1682. Keep straight ahead at the mini-roundabout immediately after the town hall, but by the next mini-roundabout take the signed footpath left into the churchyard of 13th century St Mary’s church. Keep to the tarmac path straight ahead to reach the bank of the little Misbourne opposite some pleasant almshouses. Turn right beside the cress-choked river and over the bridge. straight uphill towards Parsonage Wood ahead. Enter the wood and keep straight ahead, paralleling the road. Eventually the path flattens out. Just before it joins the road by a railway bridge, veer R to cut between some modern apartment blocks and the railway’s fence to reach another road. Cross at the traffic island, turn left under the railway bridges and right at a roundabout beyond. The station is 50m up this road, with Amersham-on-the-Hill’s main street to the left. In those wet fields the railway didn’t pay. The Metro stops at Amersham today. Been a big fan of OOTL for a while and find the walks and descriptions excellent. However, we really struggled in the woods on the way to Coleshill and got very lost. The directions say the route is tricky but appears to have now completely disappeared. There appears to have been a lot of work done in the woods recently that may have disturbed the paths set out above. It would be worth updating – if only because Earl Howe has not been a health minister since May 2015. Thanks for the heads-up – will try and get out and update this one shortly. Have amended Lord Howe’s portfolio! We found the same as Peter Wasson below. When we reached the cross-tracks on the valley floor some friendly dog walkers helped us out! We also came out of the woods behind Penn church not opposite the road towards Mop End so had to walk on the grass on the side of the A404, but for no more than about 250m. 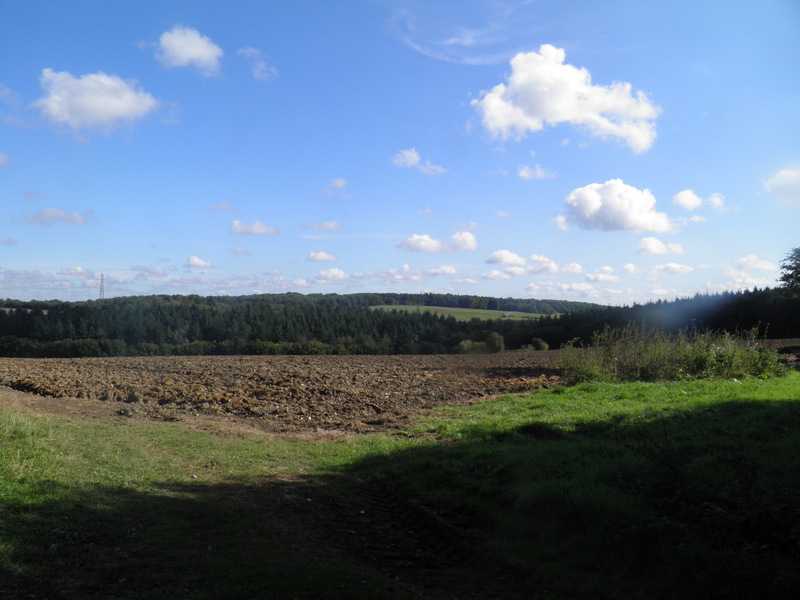 We really enjoyed the walk, it took in some fabulous scenery and very different terrain. The Red Lion at Coleshill was a great stop for lunch, further on, The Plough Inn at Winchmore Hill looked good too.